Hello to you all on Facebook! Thanks to this handy tutorial I've imported my blog into my private profile and my Laura Cameron artist's page so you can all see when I update the blog. 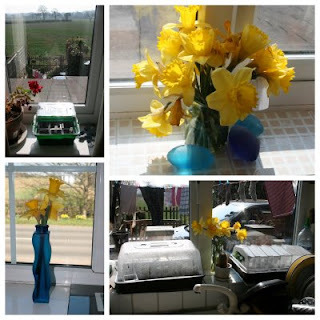 It is a beautiful day, the daffodils are gorgeous, the Edial crows are on the search for twigs, the washing is out on the line and there are mini greenhouses on nearly all the windowsills, I love spring!